Did a man named Sam Hyde open fire at a tram in the Dutch city of Utrecht today? No, that's not true: a shooting did happen there but internet trolls immediately started blaming the comedian for it like they do with every shooting or terrorism incident. Police in the Netherlands say multiple people have been injured after a shooting incident inside a tram in the Dutch town of Utrecht. 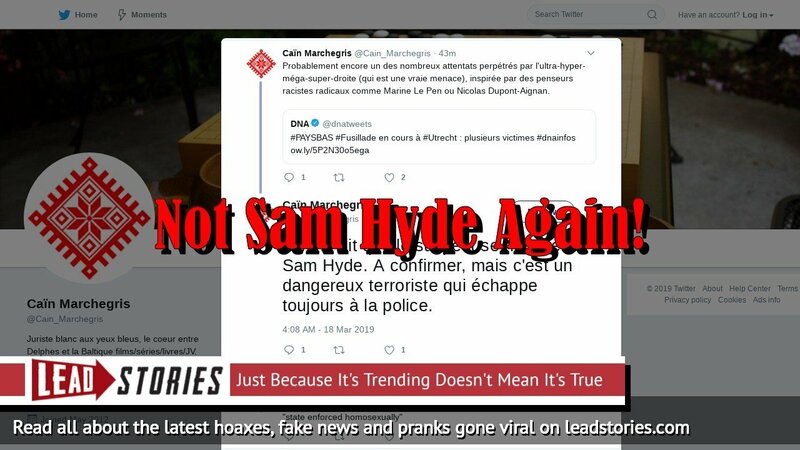 Blaming right-wing comedian Sam Hyde of being the suspect after a mass shooting is a strange in-joke that has been going on for years. Sam Hyde is not the perpetrator of a mass shooting. But whenever a shooter strikes and the news reports casualties, trolls race to name Hyde as the culprit. In the worst cases, authorities have been tricked into giving Hyde's name to the press. Sam Hyde is an Internet comedian who co-founded the sketch comedy group Million Dollar Extreme and rose to viral video fame after staging a satirical TEDx talk about wonders of the future at Drexel University in October 2013.